We’re in the prime of British asparagus season, with May being Asparagus Month and a great time to explore this vegetable in all its many shapes and guises. Asparagus is, in general, a pretty awesome vegetable and happens to be extremely handy for people who do the intermittent fasting (aka 5:2 fast diet) thing. In fact, asparagus is good for anyone watching their calories – one medium spear of asparagus has just 3 calories but packs loads of flavour and can make traditional, boring “diet foods” into something quite interesting. Case in point: salads. 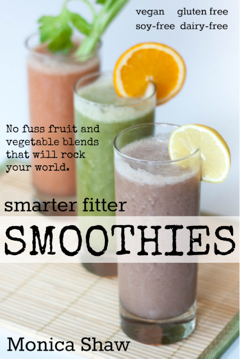 This is a favourite for many fasters and calorie counters because it allows one to have a big ol’ pile of food – quite nutritious food, at that – without necessarily having a big ol’ pile of calories along with it. But salads can be problematic: how many of us have eating a gargantuan salad only to find ourselves deeply unsatisfied at the end of it? Let’s face it, there are many dimensions to food satisfaction: not only quantity, but flavour and texture, too. This is where asparagus can come to a salad’s rescue with its notable flavour and crisp bite (provided you don’t boil it to death). It also pairs extremely well with other fast-friendly foods like eggs and potatoes, plus fresh herbs like dill, tarragon and chives, which all together can make a salad so much more than a pile of leaves. Dressing helps, too, but even a simple treatment of lemon juice and olive oil with salt and pepper can go along way (a little Parmesan helps, too, which is fairly low-calorie as far as cheeses go). But if you want to take it a little further, I can heartily recommend the tarragon vinaigrette recipe I’ve posted below, a little something I learned from The Vegetarian Cookery School that has proved infinitely versatile and especially stunning with potato, eggs and, yes, asparagus. 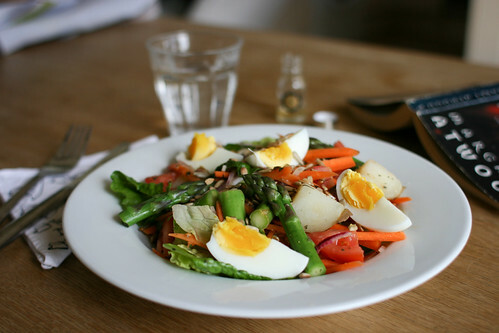 All together it makes for an incredibly flavoursome fast day lunch or dinner dish – it clocks in at about 250 Calories, leaving you plenty of extra calories (250 if you’re a woman, 350 if you’re a man) for another asparagus session for later in the day. You can adapt this recipe to use whatever salad vegetables you have on hand; the dressing is marvellously versatile, but is especially good with potatoes and light cheeses like ricotta and fresh goats curd. Calories: ~250. Make the tarragon vinaigrette by whisking together all of the ingredients in a bowl (this makes more than you’ll need so store the rest for future salads). 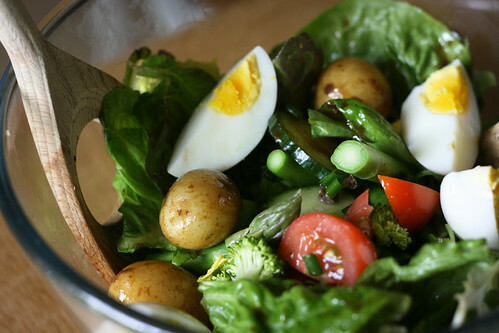 Combine the asparagus, potatoes, carrots, tomato and lettuce leaves in a bowl. Toss with ~1 Tbsp of tarragon vinaigrette, plus a pinch of salt and a good grind of pepper. Serve garnished with the boiled egg and a lemon wedge (in case it needs a little extra zing). This post originally appeared on Great British Chefs. Well, my salad is sort of like your quiche… deconstructed. Without the yummy pastry. Salad instead. OK, so nothing like a quiche. Sounds excellent, though! Beautiful salad! 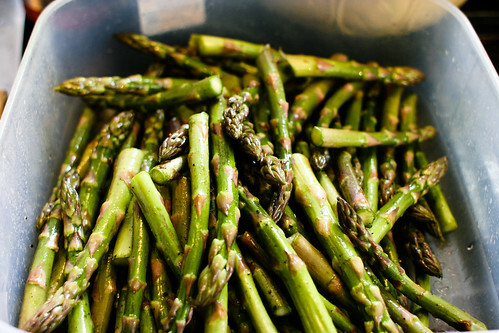 I’m loving that my fridge is chock full of asparagus right now–it never gets old to me.